Home Tags Posts tagged with "thanksgiving parade"
On Thursday, November 22nd, America celebrates Thanksgiving, the traditional harvest feast which dates back to 1621. Check the list below for the best ways to give thanks, whether it’s on a traditional plantation or with giant helium balloons. There is always something going on in the city that never sleeps. But on November 22nd, all eyes turn skyward and the city turns out for one event and one event only. 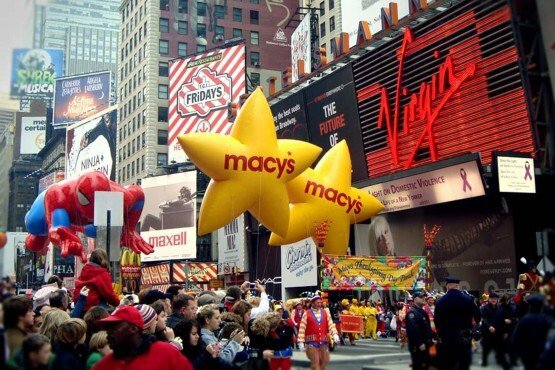 The Macy’s Parade is not only attended by hundreds of thousands of people but is televised throughout the USA. Broadway is transformed into a colorful extravaganza as floats and falloons (half-way between a float and a balloon) march together. Barbie, Mickey Mouse and Big Bird will mingle with Uncle Sam, Santa Claus and Thanksgiving’s own Tom Turkey to parade through Times Square and down the Avenue of the Americas. Marching bands, the Radio City Rockettes and cast members from Broadway shows will also perform alongside them. Although Thanksgiving is now better known as a festival involving giant balloons and music, there is a more authentic way to commemorate America’s forefathers. For a taste of history and the real meaning of Thanksgiving it is best to head to Massachussetts, the birthplace of the holiday. At the Plimoth Plantation, visitors can board the Mayflower II, which recreated the original Pilgrims’ journey in the 1950s and now forms part of a special exhibition about the voyage. Actors dressed as Pilgrims and the indigenous Wampanoag people will guide you through the story of the first Thanksgiving. Visitors also have the chance to explore a traditional 1627 English village, the crafts centre and, in true Thanksgiving spirit, there are a multitude of different places to eat the traditional turkey dinner. It may not be what the Pilgrims imagined their legacy to be, but one extremely popular way to celebrate Thanksgiving is by watching the classic battles between some of America’s most loved football teams. It is not unusual for the family to settle down and watch what is referred to as Turkey Bowl as different teams – which normally include the Miami Dolphins, Detroit Lions and Dallas Cowboys – fight it out. For visitors to the country, this could be the perfect opportunity to indulge in a truly American pastime and try and learn the rules of a baffling game. Tickets are still available and are relatively affordable from $45. www.ticketexchangebyticketmaster.com. If you thought the Macy’s parade was big then prepare yourself for the inflatable extravaganza that takes over Chicago. One of the city’s most popular events since it started in 1934, the parade regularly pulls in crowds of 400,000. It was first created as a way to help people feel better during the Great Depression of the 1930s so visitors to the city this Thanksgiving may feel a strange irony given the current economic climate. Like all great celebrations, Thanksgiving would not be a true national holiday without some cut-price bargains to encourage people to part with their cash. And sales are particularly worthwhile at the outlet stores that are so popular with visitors to the US. Some of the biggest outlets are Woodbury Common Premium Outlets in New York, Orlando Premium Outlets, Florida and Wrentham Village Premium Outlets in both New York and Boston. So any shopaholics in these malls over Thanksgiving may well want to take advantage of some serious bargains. Discounts of between 25 and 65% are offered on designer items in their Midnight Madness sale event (which actually starts at 9:00 p.m.). Beyond the grand parades and American football, there are actually a lot of smaller Thanksgiving celebrations taking place throughout the country. Anyone enjoying West Coast hospitality in Oregon may want to head to one of the nation’s quirkier events. According to these Oregon residents, nothing says Thanksgiving like bowling a Turkey. In a new take on Turkey Bowl, Hood River offers a train ride out into the state’s most breathtaking scenery where people can enjoy a traditional holiday meal at a rural restaurant before starting on the real festivities. This competition sees people bowling five, 10 or 20 lb turkeys in the hope of winning a variety of prizes. Taking place over the Thanksgiving weekend and costing $32 for an adult ticket and $20 for children, the day out could really add an interesting twist to the traditional Thanksgiving activities. Not everyone has the Thanksgiving holidays off – in fact some women will be working very hard in Aspen. If you are in the Washington area and think you have a hope of swinging an invite to the White House, you may want to head there the week before Thanksgiving. Traditionally the President holds a lighthearted gathering and pardons a turkey which is saved from becoming dinner and sent to live its life in peace. But if, like the rest of us, it is unlikely you will be calling in at the White House, you can always catch a glimpse of the lucky turkey at Disneyland in California. After the presidential touch grants turkeys their freedom, they are sent down to take part in the Thanksgiving Disney Parade. They lead the spectacular parade as grand marshalls, joined by all of the familiar faces we associate with Disney. Once their duties are done, they are free to live out their days in the Frontierland part of the park. Find out more about Disneyland holidays here.